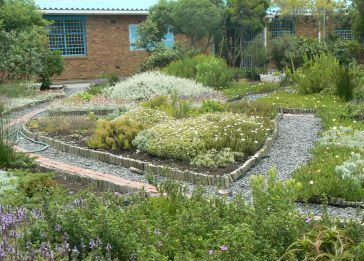 The Outreach Greening Programme works with self-motivated schools and community organisations to establish indigenous water-wise gardens. It aims to provide learners, educators and community members with the knowledge and practical horticultural skills required to plan, establish, maintain and extend indigenous gardens. The programme also encourages ecological awareness, environmental responsibility and economic empowerment. This programme was initiated in 1997 at Kirstenbosch NBG and, to date, indigenous gardens have been established in more than 90 primary and high schools. The Outreach Greening Schools Programme is driven by the demand from self-motivated schools wanting to establish indigenous gardens. Schools are required to submit an application letter on a school letterhead providing all relevant motivations for their selection. The Outreach Greening staff members arrange site visits and interviews with the schools in November of each year. Based on the established selection criteria, five schools are chosen to participate per year. Schools not selected in one year are encouraged to improve on their environmental initiatives and apply again. Each school establishes a ‘Green Team’ to champion the project. Ideally, a ‘Green Team’ consists of educators, learners, community members and the school’s groundsman. The ‘Green Teams’ attend a series of horticultural workshops and learn about various aspects of garden design, soil quality, planting, plant propagation and garden maintenance. After each workshop, the ‘Green Team’ of each school immediately implements what they have learnt back at school in the step-by-step process of developing their own indigenous garden. Regular site visits by the Outreach Greening staff members help to monitor each school’s progress. The Outreach Greening Programme provides the compost, plants, mulch and a toolkit of gardening equipment to each school. In their second year on the programme, the schools are required to plan and implement an extension of their garden. The educators attend workshops which build their capacity to create interpretation plant labels and storyboards for their garden. They are then required to develop curriculum-linked lessons that can be facilitated in their school gardens. Continued support is given to the schools as they maintain their garden and use it as an educational resource. 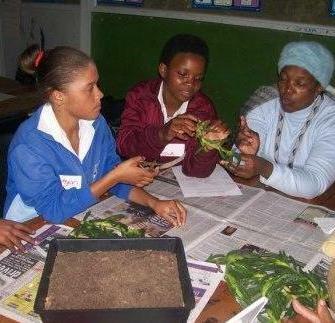 Schools are encouraged to initiate vegetable gardens and establish partnerships with various organisations that can assist them with their school garden. Each school in the third year of the programme is required to plan and facilitate an “Open-Day” ceremony which celebrates their achievements and officially signifies the end of their participation in the programme. 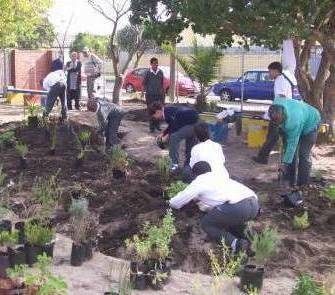 Many schools, tertiary institutions and community groups request assistance with their own greening initiatives. Depending on the needs of each individual case, the Outreach Greening staff members are able to assist with horticultural advice and/or plant donations. The success of this vibrant programme is directly as a result of the generous funding and sponsorships received. While some organisations have sponsored the programme broadly, others have selected to support schools or community projects on an individual basis. Many organisations support the programme in kind. The Outreach Greening Programme invites sponsors to involve themselves directly with one or more participating schools or community projects and to establish developmental partnerships that extend beyond greening as well.